The Beechwood Home is a unique organization made up of employees with special skills and attributes to meet the needs of our 80 residents. 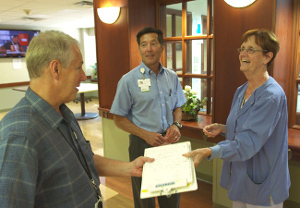 We have been providing this quality care to our residents since 1865. When caring for the sick it takes a special personality with patience and compassion that will treat our residents as family. We are always looking for great candidates with exceptional skills and experience to become part of the Beechwood Home family. We need nurses and STNAs who are self-motivated individuals who are willing to work hard in return for the great rewards of smiles, job satisfaction and the appreciation you will get knowing you are helping those who cannot help themselves. If this sounds like the place for you please apply! We offer above market compensation, medical, dental, vision and life insurance benefits to our staff that average 30 hours per week. In addition we have a beautiful facility located in a residential area of Cincinnati. Thank you for considering a career with Beechwood Home. Please take a moment to send your resume to us at HR@beechwoodhome.com or fill out an online application using the button below.